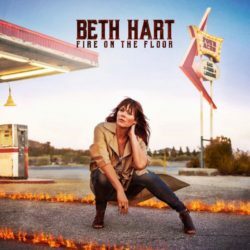 In the most recent installment to her already vast discography, Grammy-nominated singer-songwriter Beth Hart returns this month with Fire On The Floor, showcasing an array of emotions and a heartfelt sincerity that reflects the challenges of recording her 2015 release Better Than Home. The aptly-named ‘Jazz Man’ opens the record with a helping of smooth melodies and an infectious chorus that compliments Hart’s vocal intensity. ‘Love Gangster’ then slows the tempo in a seductive, Cuban-inspired effort while the smouldering ‘Coca Cola’ features a sultry blues influence that echoes throughout the rest of the album. ‘Let’s Get Together’ however marks a departure from Hart’s usual intensity in an upbeat and reasonably cheerful soul-pop track, but there’s darker moments too – ‘Love Is A Lie’ takes the form of a grunge-fuelled rock effort, depicting raw aggression and a burst of attitude, before ‘Fat Man’ secures the middle ground between hard rock and blues. On Fire On The Floor, with its jazz-infused rhythms and blues-heavy riffs, Hart’s soulful voice is stronger than ever.